As of writing of this post, I prefer NUnit when using .Net for developing application deployment tests. Why? Simply put, better support and test execution. More importantly, the ability to simply reference test runners without installing the actual test execution files (Like VSTest or MSTest). This guide will walk you through on developing simple tests via NUnit, build the artifacts then executing those tests on the server where the application is being deployed to. NOTE: NUnit and MSTest are completely separate testing frameworks. You can mix/reference both NUnit and MSTest Test frameworks in the same VS Test Project and Tests (Test Methods) without duplicating the same tests. This however is a separate post. 1) Develop NUnit Tests to validate application deployment. Before proceeding, you need to ensure that you at least have one application deployment tests. The number of tests vary on the application that you want to verify. In my scenario, I’m deploying a Web API so one of the tests to validate is whether a web method works after deployment. Reference NUnit assemblies in your test project. Expand your Test Project, right click on “References” and click on “Manage NuGet Packages”. 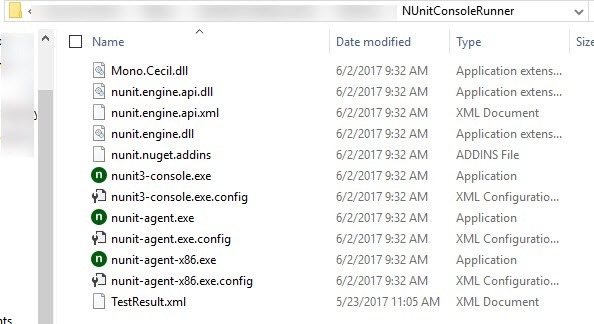 The nuget package explorer window opens and type in “Nunit” under the search box within the “Browse” tab. The goal for running tests is to ensure that the app has been deployed properly. In these situations, tests would then normally target or construct the URL based on the IP Address or the HostName of the sever then the application URL. This would be something that you’ll need to plan on how to build your application URLs correctly. There are many ways to do this and I’ll creating a separate blog post for this. Once you’ve validated your tests targeting the right server, we then package the tests as artifacts to be executed on the server. For this, see the next step. Start off by creating a build definition in VSTS. For this, follow this guide. “Build and deploy your app”. NOTE: Very Important! Make sure your Test Files includes the NUnit Console Runner assemblies and executable. 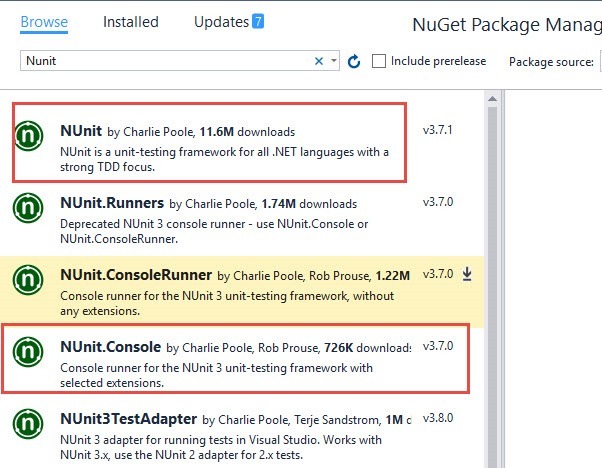 There are many ways to reference the Nuget Test Runner files but for the purpose of this demo, ensure that your Test artifacts include all test runner files. Here’s a snipped of such files.